If you’re reading this around noon today, you’ll know exactly where I am—it’ll almost be like you’re watching me in a live feed, breaking news-style. Three guesses what I’m doing? I’m down the shore in Long Branch, sucking down my first Lighthouse Italian ice of the summer. Forget those national franchises peddling water ice, and ignore those too-cold lemon ices from the grocery store that you have to scrape, scrape, scrape with a wooden stick just to get a halfway satisfying bite. 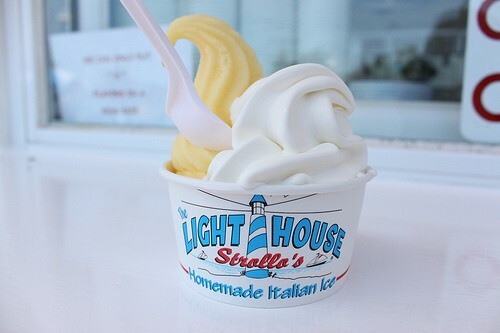 Actually, forget lemon ice altogether when you visit the Lighthouse—I’ve got something even better for you. 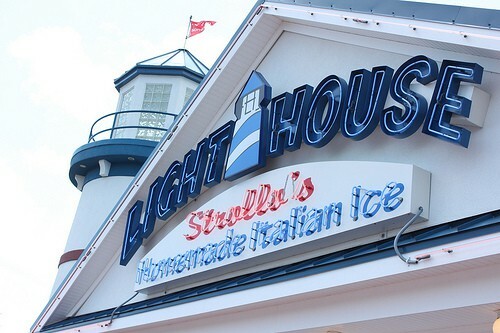 The Strollo family, who’s been operating the original Long Branch location since 1976, along with its Jersey shore offshoots, doesn’t scoop their Italian ice from a tub in a freezer like everyone else does. They use soft-serve machines, swirling the sweet and fruity blend into waxed-paper squeeze cups instead of mounding it into spheres. This small but ingenious difference gives the ice an incredibly smooth crystalline consistency—no chunky, granular granita-style texture here, just refreshing, brain-freezing, silky ice that goes down easy. Sure, you can mix and match any of the Lighthouse Italian ice or ice cream flavors in a cup—root beer with vanilla, cantaloupe with coconut, chocolate with cappuccino with cherry—or you can stick to the traditional lemon ice on its own if that’s your thing. You can blend them together in a shake, ask for an Italian ice float, or work your way through samples of every one of the dozen or so flavors churning every day until you find a winner. 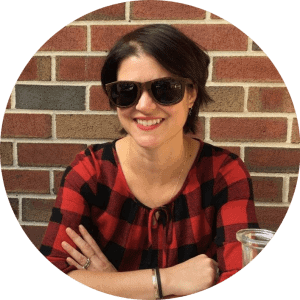 You can even ignore the Italian ice flavors altogether like my husband, who, without fail, goes for a soft-serve vanilla ice cream with chocolate dip (the ice cream, by the way, comes from New Jersey’s own Welsh Farms). 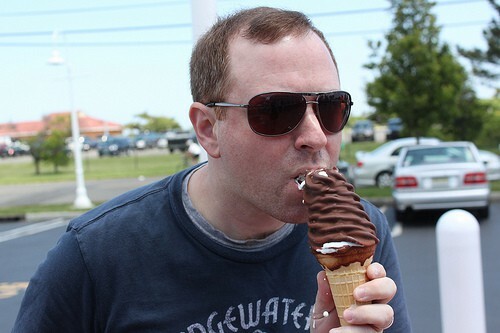 On a hot day, it’ll start sweating pores of melted vanilla through the delicate, waxy chocolate layer, so eating the cone becomes a race against the clock. Hint: don’t wear your best t-shirt if you’re planning on ordering this one. Whatever you choose, you’ll be digging into a Jersey shore tradition that’s been around almost as long as Bruce Springsteen, and is just as much of a rock star in its own right. It ain’t summer on the Shore until you’ve had one.